Welcome to a world where big cities are dying, dead - or transformed into technological megastructures. Where once-thriving suburbs are now treacherous Wilds. Where those who live for technology battle those who would die rather than embrace it. It is a world of zero-footprint cities, virtual nations, and armed camps of eco-survivalists. Welcome to the dawn of uncivilization. METAtropolis is an intelligent and stunning creation of five of today's cutting-edge science-fiction writers: 2008 Hugo Award winners John Scalzi and Elizabeth Bear; Campbell Award winner Jay Lake; plus fan favorites Tobias Buckell and Karl Schroeder. Together they set the ground rules and developed the parameters of this "shared universe", then wrote five original novellas - all linked, but each a separate tale. 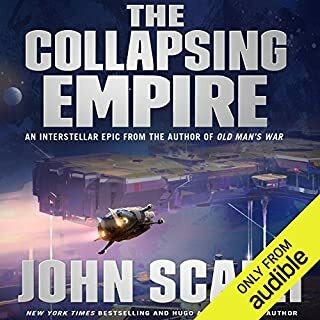 Bringing this audiobook to life is a dream team of performers: Battlestar Galactica's Michael Hogan ("Saul Tigh"); Alessandro Juliani ("Felix Gaeta"); and Kandyse McClure ("Anastasia 'Dee' Dualla"); plus legendary audiobook narrators Scott Brick (Dune) and Stefan Rudnicki (Ender's Game). 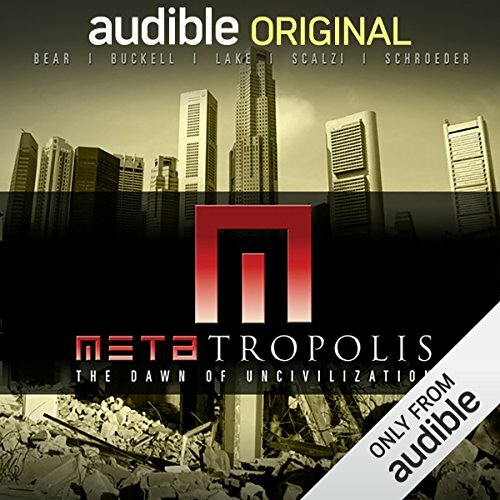 John Scalzi, who served as Project Editor, introduces each story, offering insight into how the METAtropolis team created this unique project exclusively for digital audio. ©2008 Joseph E. Lake, Jr., Tobias S. Buckell, Elizabeth Bear, John Scalzi, Karl Schroeder (P)2008 Audible, Inc. I was hesitant to get this Audible Frontiers audiobook because I generally don't enjoy anthologies. However, I found the Metatropolis stories fascinating -- several stories include references to ecology-related technology changes and the narrators are top-notch. Highly recommended for sci-fi/cli-fi fans. I really enjoyed the worlds created by the authors. I would have enjoyed it more if the author doing the narrating hadn't yakked about himself and the process so much in between the stories. That could have come at the end of the "book", after the stories, as a "how this book was made" commentary. Otherwise cool stories with some memorable characters and concepts. I like the concept of a shared world and overall this is an entertaining audiobook, but like any anthology some stories are better than others. In the Forests of the Night by Jake Lake was an extended pseudospiritual/political rant that never answers the most obvious question, i.e. who is Tygre? I liked Stochasti-city by Tobias Buckell at least in part because it is read by Scott Brick but also because it is entertaining and interesting although the ideas of ex-military street mercs and repurposing abandoned urban real estate were done (better) decades ago by William Gibson. The Elizabeth Bear story elicited an enthusiastic meh. The characters just were not that compelling and there was not much of a plot to resolve. John Scalzi is a good writer with a good sense of humor and a lighter tone was needed by this point. His story was funny, but at times it comes across like a 1980s comedy film: slacker hero saves the world through pranking. Not a spoiler, because you see it coming a mile away. They saved the best for last. To Hie from Far Cilenia by Karl Schroeder is the most thought-provoking of the set. It was a quirky combination of The Diamond Age by Neal Stephenson and Spook Country by William Gibson with a heavy dose of Stephensonian fascination with currency. Being a huge fan of both Stephenson and Gibson, it worked for me. The fact that Stefan Ruknicki is a brilliant reader helps too. The whole collection owes a lot to Gibson, even the various green movements (anybody remember the Sandbenders? ), but Gibson was less heavy-handed than these stories. It does put a nice big flashing date stamp on the era at least. Half the science fiction books in the 80s were about nuclear Armageddon, half today are about environmental Armageddon. Anyway, it serves as a good screenshot of contemporary writing and is worth a listen. I can’t believe I just discovered this in 2014. Produced by Audible in 2008, it’s an anthology based on a future world built by five of today’s best scifi authors. When I realized one of the world-builders was Karl Schroeder I knew I had to get this immediately. This anthology did not disappoint, and the audio version features several well-known scifi television actors whose voices, if not their names, will be immediately recognizable to any scifi fans. 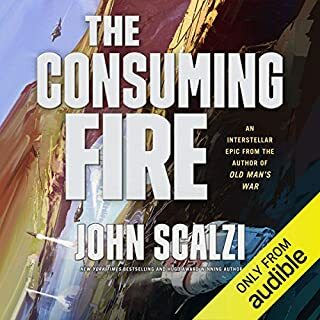 The audio begins with John Scalzi giving a general overview of the project, and Scalzi also introduces each story. The first story is by Jay Lake and read by Michael Hogan. I must admit that I didn’t recognize the name, but as soon as the voice started coming out of my phone, I knew it was Colonel Tigh from the Battlestar Galactica reboot. He has a really recognizable, earthy cadence that suited this story perfectly. I would love to hear him read more audio books. Oh, and the story was fantastic, too. 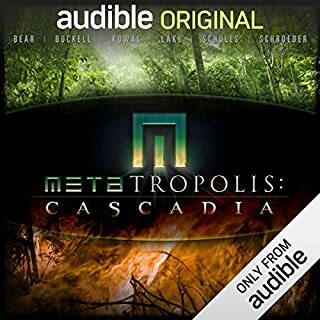 It did a great job of setting the scene for all the stories that follow (particularly all the stories in the follow-up volume, METAtropolis: Cascadia). Both the setting—the rainforests of the American/Canadian Northwest—and the characters—a group of ecology fanatics living in secrecy—were completely different from anything I have ever read before. I definitely want more of this!! The second story is by Tobias Buckell and narrated by the always fabulous Scott Brick. This story is set in a future Detroit that is a model for the reclamation of all the other cities in North America, all of which have been decimated by a “slow apocalypse.” This is another term I have never heard before, but as the concept is rolled out in each story, it becomes clearer. The basic idea is that capitalism went into a slow decline, and now in the latter half of the 21st century, civilization has broken down into autonomous city-states, each one with a different mechanism for survival. Detroit is being reclaimed through re-use, such as urban farming inside skyscrapers, that allows the residents to produce more food than they need. The story also introduced me to the concept of “turking,” which was like crowdsourcing combined with Craig’s List and extrapolated. Many functions that were formerly taken care of by government, including mail delivery, are randomly distributed to regular citizens, who pick up small jobs to earn small change, and thus the city continues to function. Detroit is a shining beacon of hope for humanity, a sentiment which I found refreshingly positive. The third story is by Elizabeth Bear and is read by Kandyse McClure is also set in Detroit. Like the previous story, most people get around on bicycles, and people share resources, equipment and living space. Collective living, including child rearing and food production, is now the norm, enabling local communities to produce what they need now that the global marketplace and distribution system has failed. 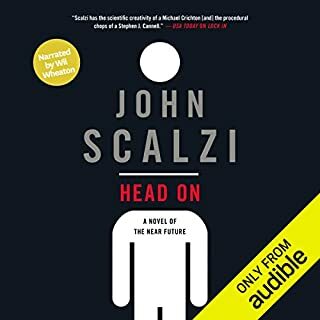 The fourth story, by John Scalzi, was funny and inventive, describing in more detail how localized food production works in this brave new world. Alessandro Juliani, who played Lt. Gaeta on the new Battlestar Galactica, gave it a great reading. Wil Wheaton, who has performed most if not all of Scalzi’s audiobooks, may have lost his gig. The last story, by Karl Schroeder, was the best of all. The reader, Stefan Rudnicki, sounds just like Michael Ansara, his deep bass perfectly portraying the Russian protagonist’s phlegmatic reaction to the James Bond-like situations in which he finds himself in this thriller of a tale. In between the harrowing escapes and dangerous dilemnas, Schroeder introduces more new future city concepts than all the previous authors combined. Much of the action takes place in a virtual world, where people use avatars to produce real wealth. This was somewhat reminiscent of the plot of Reamde, but with much more detail about the virtual world and how it works. The concepts put forth by Schroeder are so new and interesting, I think I have to listen to this story again to fully grasp what he is describing. 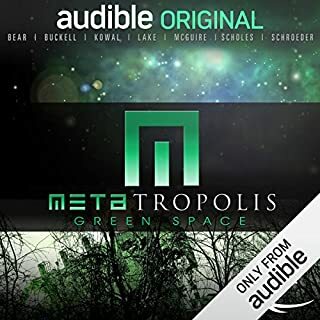 This collection was so great that I immediately downloaded the next two books in the series: METAtropolis: Cacadia and METAtropolis: Green Space. I really wanted to like this, but ultimately it just didn't seem to hit the mark, coming off as a collection of mediocre adverts for the authors rather than a real attempt at a connected collection of short stories. The quality of the voice acting was variable also. It's not all bad; a couple of stories are worthy in their own right, but as a collection, there's just not enough to hold it together. at the end of the book, I was really satisfied with it. I thought the world-building exercise engaged in by the authors of this anthology was really successful. They created an experience that had aspects of recognizable civilization and made it clear where they had used their imaginations to create followable paths toward the future of trends already starting in cities of today. Crowdsourcing, community action, all were represented. The only problem I really had with the book was that sometimes, the characters were forced into the plot rather quickly. They didn't always get the chance to ferment properly and develop. Sometimes this works, sometimes it doesn't. Even when it doesn't, it's not a story killer. The plotting of the stories, and the fantastic science fiction really make up for any character weaknesses. Excellant read. I'll be getting the next book this month! I was extremely disappointed in this collection. The first story made no sense at all. The next two were dull and implausible. And then I gave up. Maybe the final two are modern masterpieces but I just don't have the patience to find out. The first three stories lacked compelling characters or believable situations and I grew tired of dialogue that sounded more like people lecturing each other about sustainability and carbon footprints. There's plenty of great science fiction on Audible, don't waste your credit on this bore. Every story was interesting and they wove together rather well. The first story was probably the weakest in my opinion, because it never really explains itself to the listener very well. Still, even that story was fun to listen to. I'd really like to see more stories written in this alternate future world. The stories were ok, but nothing special. The shared world gimmick really did not play a major role--these stories would have had the same impact as stand-alone stories (George R. R. Martin's Wild Cards shared world series is an example of how the shared world concept can be used to wonderful effect). 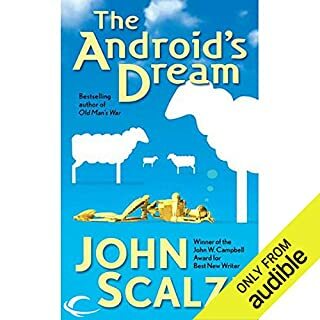 John Scalzi's lighthearted tale of a pig farmer was the best of the bunch, probably because it was the least preachy and easiest to follow the plot. All of the stories seemed to follow the same basic format, i.e., outsiders trying to usurp the technological progress of the city-states. The biggest problem with this audio book is the varying quality of the readers. Michael Hogan snarls his way through Jay Lake's opening novella and Stefan Rudnicki growls through the final story by Karl Schroeder. Kandyse McClure and Scott Brick do good jobs, with Alessandro Juliani doing the best (or perhaps he was blessed with reading Scalzi's fun story). This audio book is nominated for the Best Dramatic Presentation Hugo Award for some inexplicable reason. It's ratings on Audible.com and LibraryThing.com are so-so at best, and it did not appear on any Best of the Year lists that I saw. My guess is that people voted for it based on name recognition without actually listening to it.